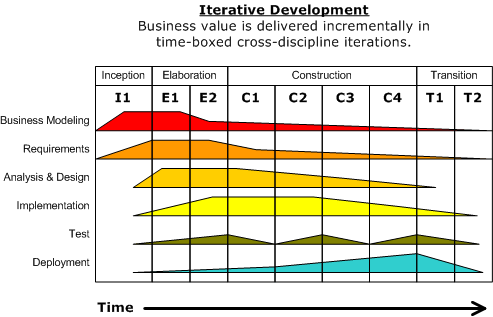 The Rational Unified Process (RUP) is an iterative software development process framework created by the Rational Software Corporation, a division of IBM since 2003. RUP is not a single concrete prescriptive process, but rather an adaptable process framework, intended to be tailored by the development organizations and software project teams that will select the elements of the process that are appropriate for their needs. RUP is a specific implementation of the Unified Process. the introduction of concepts and techniques from approaches such as eXtreme Programming (XP), that would later come to be known collectively as agile methods. This included techniques such as pair programming, test-first design, and papers that explained how RUP enabled XP to scale for use on larger projects. a complete overhaul of the testing discipline to better reflect how testing work was conducted in different iterative development contexts. the introduction of supporting guidance – known as “tool mentors” – for enacting the RUP practices in various tools. These essentially provided step-by-step method support to Rational tool users. automating the customization of RUP in a way that would allow customers to select parts from the RUP process framework, customize their selection with their own additions, and still incorporate improvements in subsequent releases from Rational. IBM acquired Rational Software in February 2003. Anyway if your organization seems too in trouble with classic waterfall or agile methods, give RUP a try!